North Street in Elgin will be closed until the end of the year. North Street in Elgin was closed last month due to concerns that parts of the roof of the Poundland building could drop onto shoppers below. Now Moray Council has announced that traffic restrictions will remain in place for a further 29 weeks – until the end of the year – as repairs continue. The B-listed building, which is on the corner of North Street at 161 to 163 High Street, was served an enforcement notice by the authority due to “deteriorating stonework” caused by water penetrating the roof. Initially the disruption was only expected to last for a month. However, further inspections have revealed the need for a longer closure. Yesterday, Elgin City South councillor John Divers, who is a director of the town’s business improvement district, explained the development did not come as a surprise to him. He said: “There are serious issues with the building there. Having heard about the damage inside, I’m not surprised it is going to take several months. “It’s right in the middle of Elgin’s conservation area so every effort should be made to preserve it if possible. The problems with it have actually provoked a lot of conversation about when it used to be Woolworths. 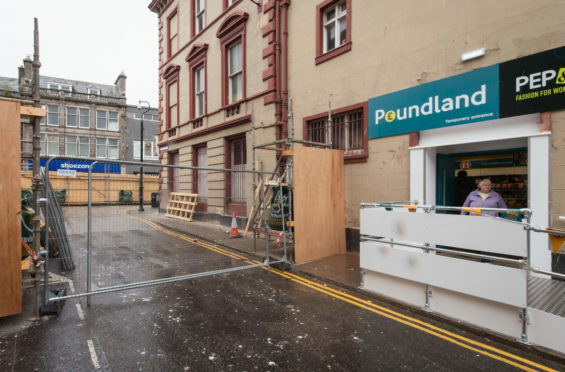 A side entrance for Poundland, which leases the site, was opened last week to allow the store to continue trading while repairs are made. The building originally opened as the A and W Reid Bank in 1856 but is most popularly remembered as Woolworths. Diversions for cars and light vans have been set up on Batchen Street, South Street, Greyfriars Road and Alexandra Road. Lorries and vehicles making deliveries for Plainstones businesses should use the Lossie Wynd and Alexandra Road.